Definition at line 105 of file route.h. Definition at line 106 of file route.h. Referenced by add_option(), do_init_route_ipv6_list(), and init_route_ipv6_list(). Definition at line 108 of file route.h. 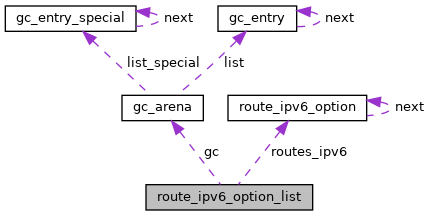 Referenced by add_route_ipv6_to_option_list(), copy_route_ipv6_option_list(), do_init_route_ipv6_list(), and new_route_ipv6_option_list(). Definition at line 107 of file route.h.